Am I the only one who enjoys the smell of a freshly dropped cardboard box on a crisp fall day? Dropped, as in dropped on my porch by my favorite Brownie, aka the UPS man. This week’s bounty contained much early holiday shopping, but I couldn’t resist a few treats for myself! The weather’s been super-duper gray here over the last few weeks and when I saw the next two books, well, let’s just say I had a moment, and caved. Thank you Knit Picks, for making it a bit too easy for me to part with my money. The first one is Kristin Knits by Kristin Nicholas. I have always been drawn to her designs and when I saw the cover of this book online and the few project photos I could find, I honestly think I started salivating like one of Pavlov’s dogs. Oh. My. Goodness. To say that this book is beautiful would be an understatement. Kristin does have an amazing eye for color and she spends a good bit of time in the front of the book on color theory, which is something I aspire to understand but sometimes fall flat in that area. I think I want to make just about every single project in this book. Except of course that the afghan about gave me hives when I saw the size of it. I am sticking by my guns that I am not doing another afghan ever again. But the hats and scarves and mittens in this book? Too cute! This book makes me happy to just sit and turn its pages. The other book on color knitting that I got was Kaffe Knits Again , by the legendary Kaffe Fassett. 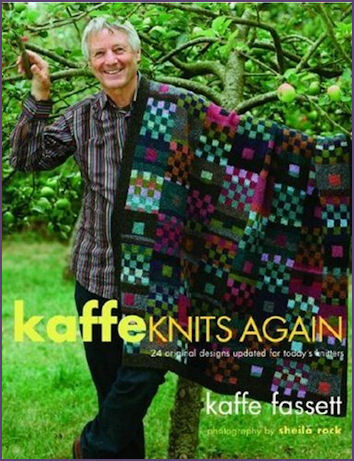 Ok, so some folks have complained that this book is just a re-invention of many of Kaffe’s previous designs. But I don’t own those books, so I’m not going to whine about that. I was so drawn to the afghans in this book, especially the stripey one with flowers. But I doubt I will ever do another afghan at this point. Maybe I should see if I can figure out how to turn that design into something wearable. I also love love love the afghan on the cover of this book. What I’d really like to know, is where do creative people get this stuff from, and why can’t I be one of those people, who can see and envision that level of creativity? I certainly am drawn to colorful things in a very powerful way. But I feel more like a worshiper of color, and it doesn’t really come from somewhere within me, like it must with these people. I am green with envy! Oops, bad pun. 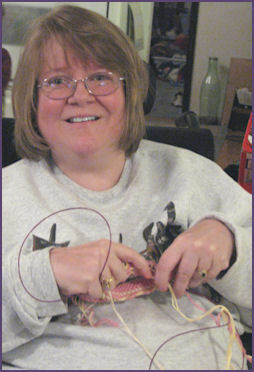 Check out Christmas Knitting in Color by Nanette Blanchard. In this little booklet, available from Lulu for immediate download (the link I’ve provided is to the Lulu shop) contains several whimsical holiday designs. My two favorites are the i-cord knitted Christmas lights shown on the cover, and the Child’s Holiday Gift Hat. It’s a hat. It’s a present. It’s a hat that’s a present. Really. You gotta go see. Your friendly neglectful blogger. More soon. Ok, usually I hate putting pics of myself on the blog, but do you see the look of absolute GLEE on my face? You wanna know where that look comes from? That’s me, NOT knitting a baby blanket! I’m doing a teeny, newborn sized baby hat in Knit Picks Shine with a brand new pair of Harmony needles. I love the yarn, which I already knew, but the needles are just perfect for it! Shine can be just a touch slippery so I do prefer to work with it on wooden needles. But because it is also cotton, it doesn’t have a huge amount of give, so the needles are *just* slippery enough to be a good fit for the yarn. The pattern is the Flower Power baby hat in Knitty. Can you say totally CUUUUUUTE? It is a quick knit with two strands of yarn held together and I actually thought I might finish it today, but tomorrow, for sure. Can’t wait to post a pic. The other reason why I’m looking giddy? I finally got a decent haircut and spent the money to do some highlights. Wednesday is my 15th wedding anniversary and I’m tired of looking 42 and drab. Ok, so I still look drab for now with no makeup and the icky Sunday ’round the house sweatshirt, but I do feel brightened up. Yesterday L. from KnitTalk came over and do you know what? She sat on my sofa and wove in my ends on my baby blanket! I still can’t believe that someone would come over and do such a thankless job. While she was here my DD continued her knitterly ways and knit up another small project. The new skill gained in doing the “Amulet Bag” was purling, as the item was knit in a ribbed pattern. After the weaving of ends was completed, L. then showed me the secrets of Mattress Stitch. I can’t believe after all this time that I have not understood and mastered this. But this was one thing I needed to see in action to understand how it is done. And, if I can whine for a second, part of that problem, I think, is not having decent access to a LYS where I can consult with an expert and learn what I need to know. Yes there are shops around but most are not wheelchair accessible. I hate that. A new shop opened up near my mom’s house too, and I was looking forward to going there, but it, too, is not wheelchair friendly. Someday I’ll have a million dollars and open my own shop where all will be welcome. Sigh. After the sewing lesson I then got a lesson in weaving in my ends as I go, so I never have another issue where I have a bazillion ends to weave in at the end. 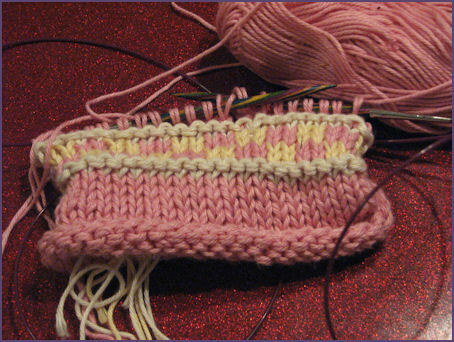 The method that L. used was not compatible with the way I hold my yarn while knitting, so I watched very closely what was happening with the yarn as she knit, and figured out a way to make it work for myself. So, yet another skill learned. Yay! While L. was here yesterday who should show up but my wonderful postman, and what did he bring? THE BOOK. 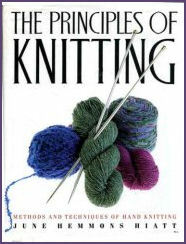 Principles of Knitting by June Hemmons-Hiatt. Knitters in the know, know what the “street value” of this book is. I, of course, was not going to pay that. Not by a long shot. But I am not the type who can scour used book stores and yard sales, and none of our bookstores are actually old enough that they might actually have an out of print book on the shelves. (I did hear of someone who actually found one in a bookstore within the last year or so, but it would have had to be on the shelves for a very long time.) So, I did compromise a little, but mostly in the area of patience. I have been waiting and searching for over a year until I was able to get one where the price was right for me. 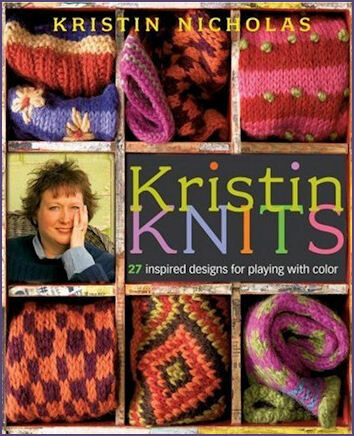 Of course, this is an “old school” knitting book where the author is somewhat rigid in her beliefs as to how things “must” be done with knitting. Since then of course, the knitting explosion has occurred and set just about all of the rules on their ears. So, I accept the snootiness with a grain of salt in favor of the unbelievable amount of knowledge this tome has to offer. I am very glad to at last have this reference on my shelf. Tonight Diana decided to sit down and knit an iPod Cozy (a la Sarah Bradberry’s Kids Knit! Simple Steps to Nifty Projects. 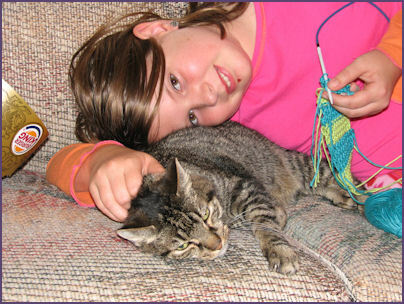 She was able to complete the knitting all at once, and so now we only have to sew it up and find some kind of closure. Tomorrow, L. comes over to help me weave in the ends of my baby blanket, and she is going to teach me some seaming techniques. I can’t wait! WHEEEEEEEEEE! It’s Finally OFF the Needles! Yesterday was a very happy knitting day, indeed. The fall chill is definitely in the air, the leaves are dropping, and it was the first day of Standard Time, which though I dread the early nights it is nice to see the sun again in the mornings. My friend Steve came over and he had a pile of long-neglected paperwork with him. For some reason, he says he does better getting his stuff done at my house. That sitting in the company of someone is an incentive to get the task done.